C.J. Stranks was a Canon of Durham Cathedral, a sometime Trustee of Lord Crewe's Charity, and well known author of a number of books including This Sumptuous Church, his history of Durham Cathedral. 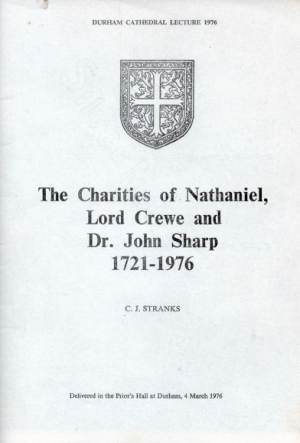 On 4th March 1976 he gave a Cathedral Lecture entitled The Charities of Nathaniel, Lord Crewe and Dr. John Sharp 1721-1976, celebrating the 255th anniversary. This is the best short history of the charity and displays an intimate knowledge of its archives. As an example, he cites payments made to the poet Christopher Smart; this fact was announced as a new literary discovery by two researchers in the Oxford University Press's journal Notes and Queries in December 2012. The lecture was published as a pamphlet by the Cathedral but has long been out of print. Canon Stranks's family have kindly agreed to the text of this lecture being made available on this site. Two pdf versions of this lecture are available to read or download below. The first is smaller (1.8mb) but of lower resolution; the second is larger (11mb) and will take longetr to download, but is a better quality scan.